I must confess that when I spoke about what the arrival of progressive web applications (PWA) in the Microsoft store might mean for Windows 10 , maybe I was too optimistic. But it is difficult not to have a positive vision of something with so much potential, but that until now is completely wasted . Except for the Twitter PWA that is quite decent and really takes advantage of the advanced features of the webapps that are integrated with Windows 10, in the Microsoft store there is little or nothing more interesting to note , even today that the Redmond have launched a new series of apps of this type . With Centennial, Microsoft wanted to motivate developers to convert their classic Win32 applications to Modern versions available in the Windows 10 app store. , and yes thanks to that we have a lot of apps that were not there before, such as Spotify, iTunes, Telegram , Slack, etc., they do not offer us anything different or new, it’s the same as if you download the .exe. With the PWA again try to try to shorten the gap for developers and thus improve its ecosystem of applications for a store that still leaves too much to be desired , especially with a Windows 10 that has 3 years between us. But until now, nothing seems to have changed much. Some eight new progressive web applications have arrived today: Rand McNally , STYLECRAZE , News dot com Australia , Boots UK , EBTH , EstateSales.NET and Rocketmiles . I bet almost none or none of your interest. Many are just websites packaged with an interesting feature that integrates with Windows 10, such as notifications. 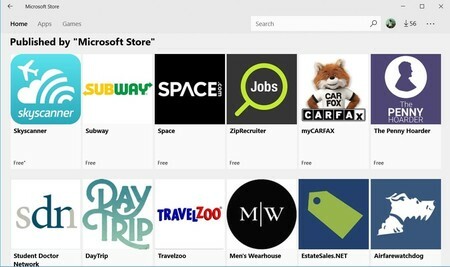 We still do not see flashy web apps in the Microsoft store , something that does not look very encouraging when it is assumed that the conversion process for developers is so simple, and also taking into account that what are currently left over are services that bet on the web as main platform. It seems that few developers bet on the Windows 10 store as a platform.